I have one irritating characteristic! I ask "Why?" a LOT! Irritating to whom? Me, of course! Gone are the days when I had my parents nearby to keep pestering them with this. At most times, my mom would be at her wit's end and would ask me "Why NOT?"! But I had issues accepting things without question if it did not make sense to me. I mean, everything should have a logical reasoning to it, shouldn't there be? Be it our cultural customs to something weird in our solar system. There should be some explanation - we either know it or we don't. But to believe and follow something blindly just cos "That's how it is", has always been a problem for me. Of course, I followed them when I had to (as if I had a choice!?) but it never meant that I was happy with it. Now this "Why?" haunts me! In something even as simple as Cooking! I need to know why you use this method, this ingredient, in this proportions. And now this time, sadly its only me who has to do all the research for "Why?" and I am left with no answers, 99% of the time! I am faced with this everlasting - "That's how it is" all the time. Now lets take this humble Mango Lassi for example. I had lots of questions for it too. "What? Are you serious? What's there to question in this recipe?" - you ask. yeah! I hear you. But listen to my side. Why 1: Why is this famous "Indian" drink when all I have enjoyed in India is either Salt Lassi or Sweet Lassi? Never heard of Mango Lassi until my advent to this country of U.S.A. While Wikipedia suggests that it is indeed famous in India/Pakistan, I was surprised that having lived in both the northern and southern parts of India, not one family, shop, restaurant carried Mango lassi!!! I detest being cheated by the "Indian" crowd this way all this while ;) Why 2: If you are using Indian classic Lassi recipe to adapt, hence the "Indian" attached to it, then why add milk to all the Mango Lassi recipes as if its "THE" ingredient? The specialty of Lassi is all about the buttermilk/Yogurt (called as "chaas"). Water is added for the consistency of the drink. Salt, spices, sweeteners are added according to what Lassi you enjoy. What is enjoyed as Lassi in the North of India, "Neer more" is enjoyed similarly in the south. "Neer" is water and "more" is yogurt/buttermilk in Tamil where the yogurt is stirred with lots of water so that it has watery consistency and spiced with salt, asafodita, and curry leaves. This is enjoyed esp. during the hot scorching months (mostly all the time!) Anyways, after a lot of difficulty I made this simple recipe. Why difficult? Well that's cos, when the hand was working, the mouth did not want to sit idle and for a mango addict that I am, I had tough time not to keep popping the mango pulp in my mouth. 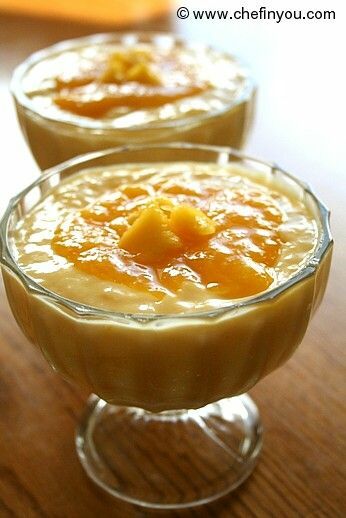 Thanks to which - so many times I was left with no mangoes to make this recipe! For other recipes, at least I have other ingredients ready and which I cannot waste - so that makes me more disciplined. But since this one did not need any other "special" ingredient - there was no wastage and there was always this "I can always make it some other time" excuse in my head. But after being requested by my other half like a million times for this, I caved in and made this the other day while he kept watch over my addiction ;). There are no specific "Do's" and "Don't" for this recipe. And "measuring" fairy will not haunt you either if you don't follow correct cups and spoon measurements. Trust your tongue and plunge in. Like the Mango flavor? Add more mango pulp. Don't want to use sugar? Try honey. No sweeteners at all? Choose v. sweet mangoes. Like it thick and creamy? Just add thick yogurt to it. Like it smooth and more like a drink? Add as much water you prefer. No hard and fast rules on this one. Play with it as per your wish and it will comply to your every wish and fancy. 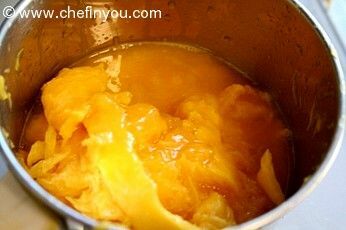 * You can use store bought Mango Pulp for this recipe. But go for the ones with no artificial Ingredients. Many add additional sweeteners to make it make it too sweet. 1. Go for ripe and sweet mangoes. It helps to avoid adding sweeteners to the recipe. I do not know what type of mango I used, but I know it was v. luscious, sweet and totally addictive ;) Peel and remove the pulp. 3. Process it until smooth. 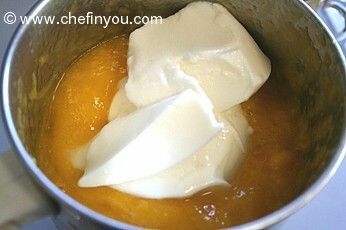 Now add the thick Yogurt. I used Low fat variety and plain. I did not add water since I like more like a smoothie. 4. Process it together until well blended. If yours is not sweet enough and too thick, add sugar/honey and water. Blend it once again - quick pulses should do. Pour it into glasses and enjoy. I also love refrigerating it for few hours and serve it chilled. 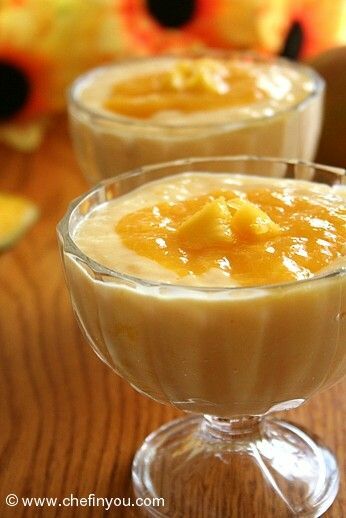 I usually serve it topped with some mango puree ( I set aside a little of the processed Mango pulp for garnish) and some chopped mango pieces. I heard of mango lassi from a good friend in Dehli, so I know people do drink this in India. But, I like your recipe, because (like you) I'd rather use vanilla yogurt than plain yogurt and sugar. Thank you for sharing this! Made this almost exactly as described the first time I heard of it... several years ago. Cardamom is excellent with mango and we also enjoy a touch of home-made chaat masala equally well. Cheers! :-D You are not only making and enjoying it... but sharing it with others. Nice! 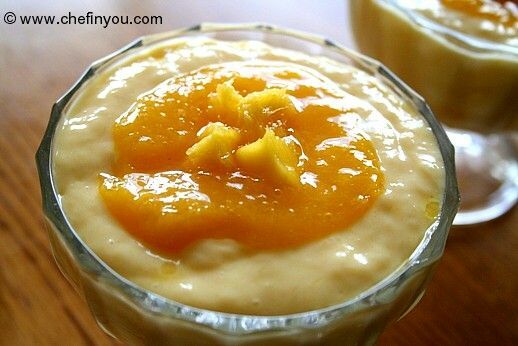 Especially...something as yummy as mango lassi. Guess what.. I am going to try to make it for our office potluck party! The mysterious country that India is you can never get the definitive answer. Let me take a shot at your whys (IMHO). 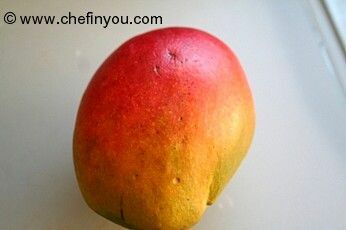 1) Traditionally mango is a seasonal fruit so you find fresh mango based foods during season only in India. 2) Good mango flavour comes from fruis that are ripe but not overly so. Therefore you would need a blender. Not something found in every village home in India. Definitely not years ago. There is a wooden churning device but the fiber in the fruit would remain intact. I suspect Mango Lassi is a modern development by an Indian chef after Sumeet (Indian blender) came along. I LOVE mangoes... most tropical fruits, really. It drives me nuts that I live in Canada. Some day I'll live where I can eat mangoes off a tree every day... This recipe looks like just my thing, though I'll have to try it with coconut milk for a vegan version. DK, again what a pleasure to read about the sweet and salt versions, of "mango lassi" and "mango nere more." This year I've noticed how the markets and the sidewalk food stands here are filled with several different kinds of mango. I very much want to try the salt version, the Tamil "nere more." I especially enjoy the curry leaf (when I can get downtown to shop for it) and have come to use asafotida, too. My favourite is mango lassi!! And this one looks delicious. 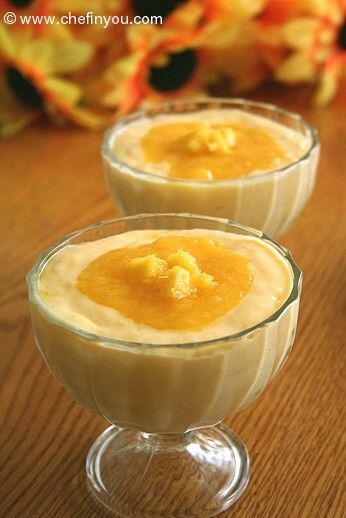 I love to eat mangos or peaches with tapioca pudding. Your photos remind me of the combo. Thanks for the recipe! Sweetie,welcome to why club. I too ask so many questions that sometimes even I myself am fed up! :( .BTW,I thght lassi and smoothie r same I didnot know the difference :-? 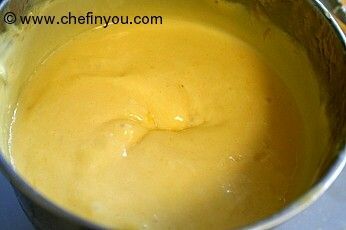 Such a droolworthy mango lassi, makes me drool..
looks so yummy and thick.